Master Chefs' Institute, LLC, announced today the addition of Jonathan Moosmiller, Certified Master Chef, as an Associate. Chef Moosmiller joins an esteemed international organization that is dedicated to preserving the highest standards of culinary excellence. Among its many services, Master Chefs’ Institute conducts comprehensive testing of food, equipment, and beverage products and awards the Master Chefs' Seal of Excellence only to those products that outperform the competition and meet the quality standards of the Master Chefs. Chef Jonathan Moosmiller earned his Certified Master Chefs (CMC) certification in 2014 after passing the arduous eight-day American Culinary Federation Exam and is one of only 67 CMCs in the United States. He is the Executive Chef of Southern Hills Country Club, Tulsa, Oklahoma, a Platinum Club® of America that hosts seven PGA and USGA Major Championships. Chef Moosmiller oversees six a la carte outlets and a large staff of cooks, stewards, and managers. He was Executive Chef at Westchester Country Club, Rye, New York, and Executive Chef at Genesee Valley Club, Rochester, New York. 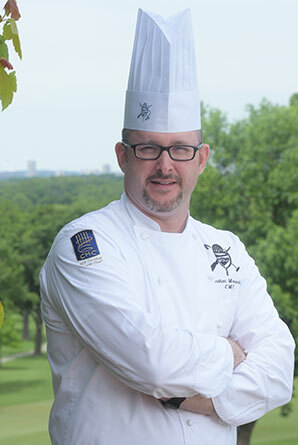 He assisted the ACF Culinary Team USA at the 2008 Culinary Olympics in Erfurt, Germany, as a sous chef. Chef Moosmiller was named ACF Northeast Region Chef of the Year in 2008. He is a member of the ACF Tulsa Chapter and holds an associate degree in culinary arts from Johnson & Wales University, Providence, Rhode Island. "I am honored to join this distinguished organization that helps chefs around the world make the best decisions for their kitchens and customers," states Chef Moosmiller. "The product choices available today as well as customer awareness of and interest in exactly what goes into a dish has never been greater. The Master Chefs' Institute's in-depth testing, in some cases of over 400 separate evaluation points, helps chefs like me precisely know what to expect from a product in terms of performance, consistency, and quality." Chef Ferdinand Metz, CMC, Managing Partner of Master Chefs' Institute states, "We are very pleased to have another Certified Master Chef join the team. Chef Moosmiller has already accomplished so much in his career, having distinguished himself with his skill, experience, and passion. He understands the responsibility of upholding the highest standards and has the integrity and talent that supports our vision. We look forward to his contributions to the Institute"